The Wave Church, Virginia, features an ultra wide screen projection with multiple units of Analog Way’s Di-VentiX, a full digital computer and video up/ down mixer scaler switcher. To blend or to warp, that is the question. Warping, blending, combining, and curving technologies increasingly define commercial video images. For integrators, this may mean new math, mastering a learning curve of aspect ratios to provide seamless applications for a variety of markets. 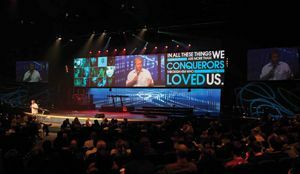 Museums, corporate lobbies, and worship centers are where the action is in terms of seeing the most in these applications, said Chuck Collins, VP, commercial AV, Digital Projection. DP’s new three-product Fusion suite is designed to provide single and multi-channel warp and blend processing for critical real-time applications such as IMAG events where minimal latency is essential. Five Digital Projection Titan WUXGA 700 projectors, seamlessly edge-blended to display product images, application shots and high-resolution photos, lit the screen for a largerthan- life spectacle at the manufacturer’s InfoComm booth this year. DP’s new Fusion 3D processor, capable of almost zero latency warp and blend for high-resolution and 3D displays, performed the seamless blend. Christie MicroTiles display serves a majority of markets, from broadcast applications such as the Colbert Report (pictured), to control rooms and digital signage. With the transition from 4:3 to 16:9, the talk turns to the future and the concept of digital canvases, Tsintzouras said. “For example, in the past, control rooms had projectors behind 80-inch cubes. Christie MicroTiles, our new digital canvas with tiny DLP-based engine blocks driven with LED illumination, can be stacked in almost any shape. This product line breaks free of conventional constraints and can be set up anywhere and in any shape, that’s the beauty of it. Some installers also add interactive elements to the front of the display for point-of-sale and multitouch purposes.” The MicroTiles display serves a majority of markets, from broadcast applications such as the Colbert Report, to control rooms and digital signage. For integrators, he said, the future is unconstrained, so they need to depend on the manufacturers as solution providers to ensure the tools are available for them to do a flawless install. “MicroTiles, for example, have ECU processors to drive them and we provide the software to layout the design and map the signals. Integrators love it as we are here to support them with a comprehensive suite of tools.